Locus Robotics' adorable bots are helping smaller e-commerce companies compete with Amazon. What, do you think the stuff you buy delivers itself? Last December, Amazon gave the public a rare look into the cutting-edge tech that helps it handle the constant deluge of online orders: its robots. The world’s largest online retailer has said it has tens of thousands of warehouse bots working across 10 of its U.S. warehouses or fulfillment centers. While the company is relying on more than 100,000 temp workers this holiday season to supplement its already massive warehouse workforce, the advantages of offloading more of that work onto machines are easy to see. Robots don’t slow. They don’t tire. They don’t get injured or distracted or sick. They don’t require paychecks or try to unionize. Amazon’s robots were invented by a company called Kiva Systems, which Amazon acquired for $775 million back in 2012. With Kiva locked down, a new player wants to give smaller online retail rivals just a bit of that robotic advantage. Locus Robotics is an offshoot of Massachusetts-based Quiet Logistics, a third-party order fulfillment company that gets merchandise out the door for big apparel retailers like Zara, Gilt Groupe, and Bonobos. And the idea behind its bots isn’t just to replace humans, but to create a system where everyone can work together more efficiently. What most people don’t realize in the age of push-button shopping is the “shopping” part doesn’t disappear. You the consumer are no longer at the store doing the physical work of tracking down the thing you want. But somebody still has to do it. For e-commerce, that task typically falls to a worker at a distribution center who must locate the product, make sure it’s not damaged, and send it off to be packed and shipped. This can be grueling, tedious work. More than anything else, it’s about walking. Lots of walking. Locus aims to have its bots do the walking instead. Or, well, rolling. Locus’ bots look something like an old-school overhead projector with wheels. While Amazon’s Kiva bots have a mechanism that allows them to physically hoist specially designed shelves and bring them to human workers, Locus’ carry bins on trays while they travel the lengths of standard-issue shelving. The idea is to cut out the worst parts of the job to let humans focus on the parts of the job that robots still can’t do, like selecting the individual items and checking them for any defects. “Work in warehouses is not always pleasant to begin with, but then you add unproductive travel time, and it works against you,” says Al Dekin, a vice president at Locus, who estimates that warehouse workers walk 10 to 15 miles a day. Despite its cute bots, however, Locus thinks of itself more as a software company than a hardware company, Dekin says. The logistics of moving merchandise from place to place in a warehouse is analogous to moving people from place to place in a city, he says: If a subway system is like a conveyor belt in a warehouse, then robots are like cars directed by a platform like Uber, sent from place to place based on availability and demand. 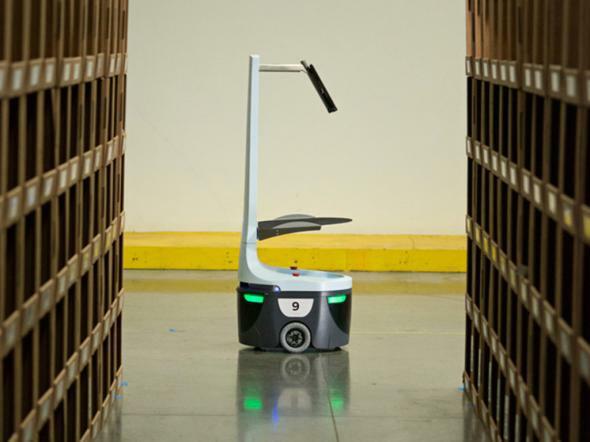 Locus has started with 10 robots roaming the Quiet Logistics warehouse, which covers some 500,000 square feet, to support the logistics operations of companies already working with the e-commerce company. In the coming weeks, perhaps just in time for the holidays, it plans to roll out more. In the new year, Locus hopes to expand to work with other companies, and the demand is likely there. Yes, Amazon dominates online retail. But e-commerce overall still has so much room to grow. E-commerce sales have grown in the double digits for years according to research firm eMarketer—in 2015 alone, it’s projected to rise 13.9 percent. Yet e-commerce still accounts for just 9 percent of total U.S. retail sales. It’s hard to imagine that figure won’t increase substantially as shopping habits continue to change. So while Amazon might be the giant that no one else can hope to catch at the moment, smaller players do have a chance to carve out space for themselves while the sector is still growing. One challenge to creating the kind of scale and efficiency that Amazon already enjoys is finding enough people to do the raw physical work that makes e-commerce possible. With machines to take up some of that load, would-be rivals have at least a modest chance of getting a leg—er, a wheel—up on Amazon.